Seeing over 40,000 river runners each year, the White Salmon is one of the most popular whitewater runs in the Pacific Northwest. Now it’ll be even more so. While environmentalists and paddlers alike are excited that the deconstruction process has begun, the river won’t be reborn overnight. PacifiCorp will continue removal activities through August 2012. The area around Condit is an active (de)construction site and will remain closed to the public until it is safe. American Whitewater encourages everyone to respect the closures and stay out of the area until the official opening of the river. At 125 feet high and 471 feet long, Condit is the 2nd tallest dam to be removed in the country. Crews began drilling a tunnel at the 90-foot base of the dam in August and blasted through the remaining tunnel today. While almost 1,000 dams have come down throughout the U.S., this is the first removal of this kind, and will expand our knowledge of dam removal and river restoration. 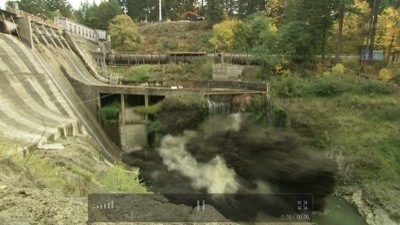 Dismantling the rest of the dam will begin next spring, and is expected to be complete by the end of August 2012. Condit was built without fish ladders in 1913, and updating the dam to today’s environmental standards would have been much costlier than removal. Today’s blast opened up 33 miles of critical coldwater habitat for steelhead and 15 miles of habitat for salmon. As a party to the 1999 settlement agreement for removal, AW has played a leadership role in representing the interests of the whitewater recreation community in the effort to remove Condit Dam.